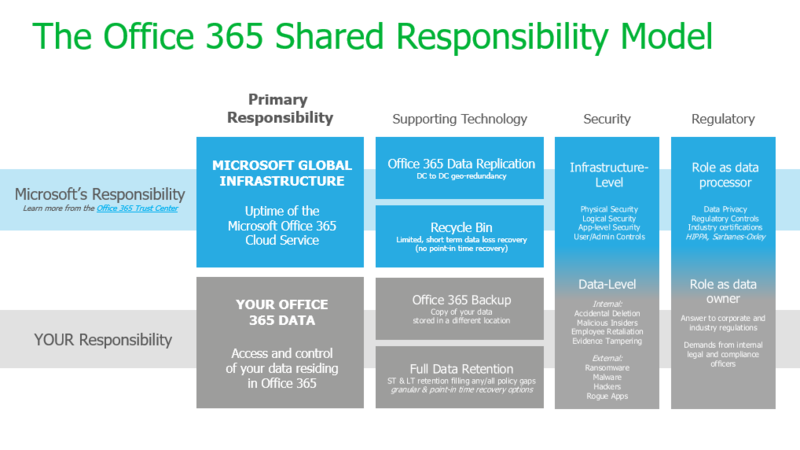 To add some clarity to this discussion, we’ve created an Office 365 Shared Responsibility Model. It’s designed to help you--and anyone close to this technology--understand exactly what Microsoft is responsible for and what responsibility falls on the business itself. After all, it is your data! Now, let’s kick this off by talking specifically about each group’s primary responsibility. Microsoft’s primary responsibility is focused on its global infrastructure and its commitment to millions of customers to keep this infrastructure up and running, consistently delivering uptime reliability of its cloud service and enabling the productivity of users across the globe. An IT organization’s responsibility is to have complete access and control of their data--regardless of where it resides. This responsibility doesn’t magically disappear simply because the organization made a business decision to utilize a SaaS application. Here you can see the supporting technology designed to help each group meet that primary responsibility. 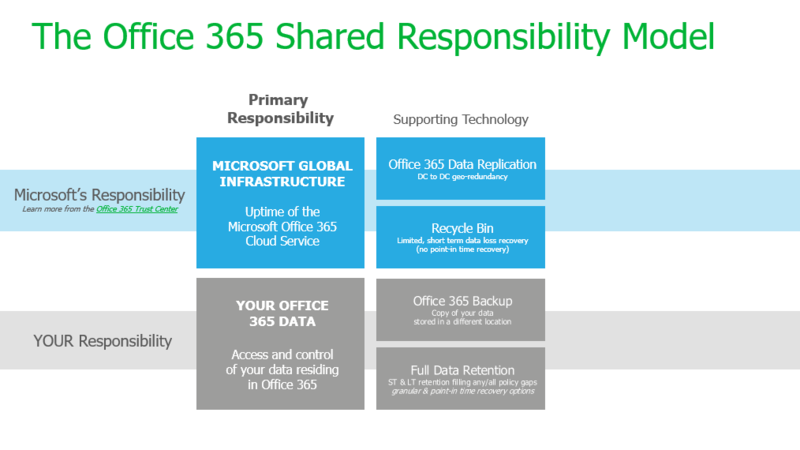 Office 365 includes built-in data replication, which provides data center-to-data center georedundancy. This functionality is a necessity. If something goes wrong at one of Microsoft’s global data centers, the company can failover to its replication target, and, in most cases, the users are completely oblivious to any change. Some of you might be thinking a replica--because data that is continuously or near-continuously replicated to a second site can eliminate application downtime. But some of you also know there are issues with a replication-only data protection strategy. For example, deleted data or corrupt data is also replicated along with good data, which means your replicated data is now also deleted or corrupt. 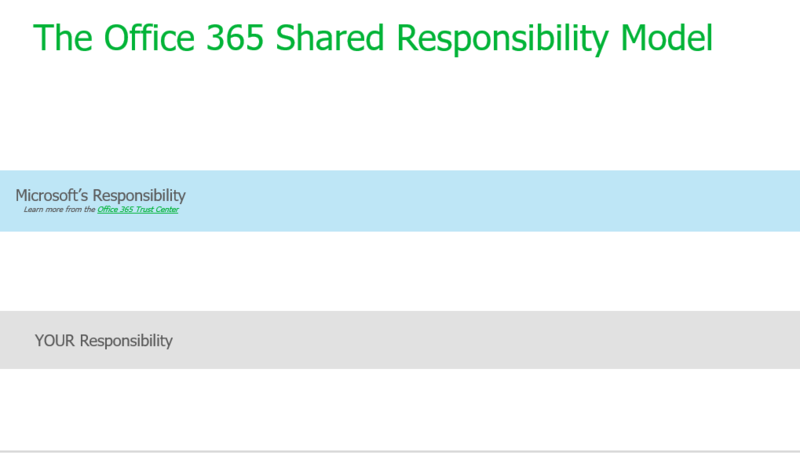 The next part of the Office 365 Shared Responsibility Model is security. 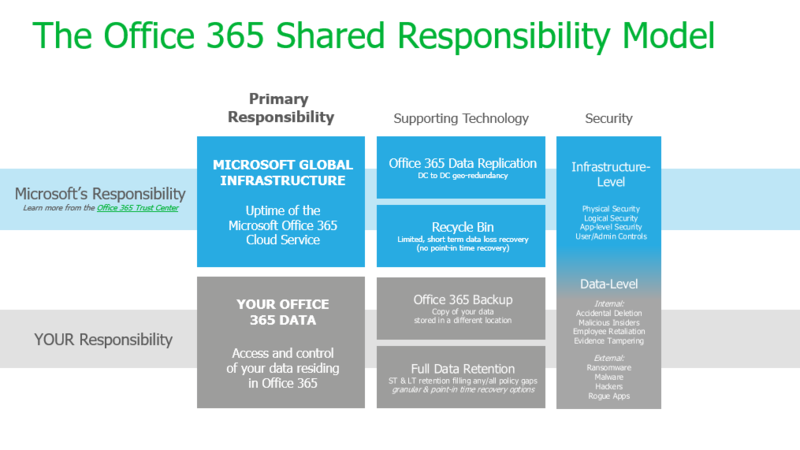 You’ll see that this is strategically designed as a blended box--not separate boxes--because both Microsoft and the IT organization are each responsible for security. 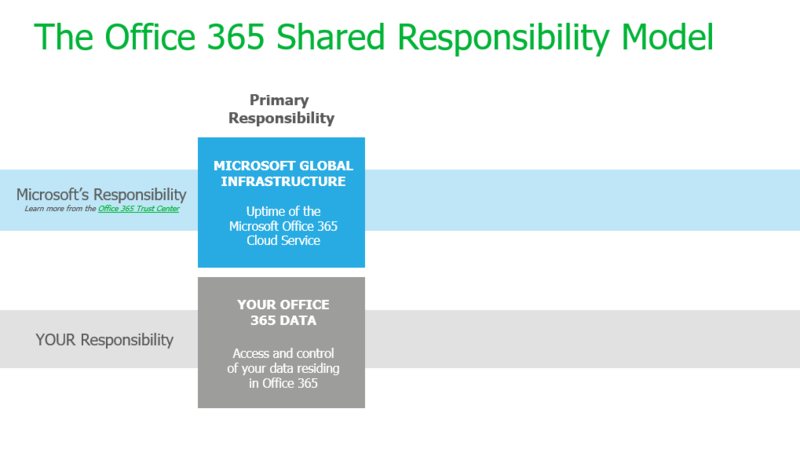 Microsoft protects Office 365 at the infrastructure level. 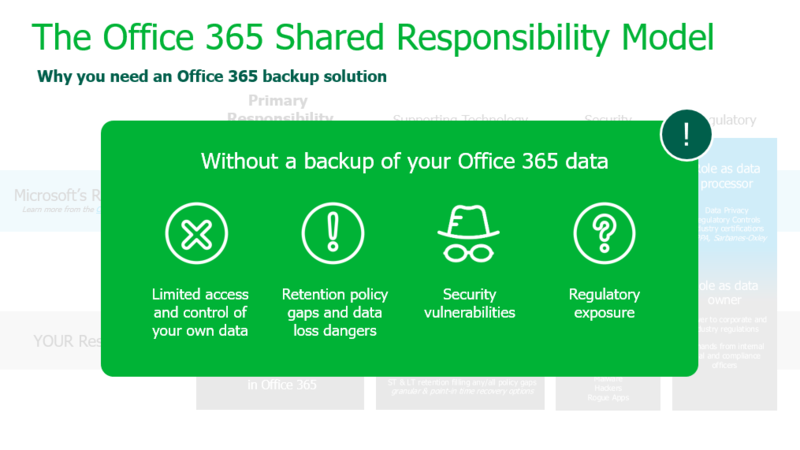 This includes the physical security of its data centers and the authentication and identification within their cloud services, as well as the user and admin controls built into the Office 365 UI.